Hi! what's d fee structure for the course..?? Nice course but understanding difficult. i want learn english like u guys. Are you ready to get the extra edge you need to beat out the competition and seal the deal on your dream job? What is Job Interview Skills training? Excellent communication and presentation skills are very often cited as deciding moments when it comes to choosing the right person for the job. But of course, there are other things that you need to get across in a job interview situation – like how well you are suited for the job, your technical competencies, your ability to grow on the job and how well you’re going to fit in with the rest of the team. Ultimately, however, it will be how well you express yourself in the job interview and how well you answer the relevant questions that will decide the outcome if you will get hired. And this is where Let’s Talk Institute’s crash course on Job Interview skills training can help you. Our Job Interview Skills training will give you the answers to all these questions, plus a plan to get you to a new job. After completing this training program, you’ll be more than ready to ace that crucial job interview. Job Interview skills manual covering surefire essentials. 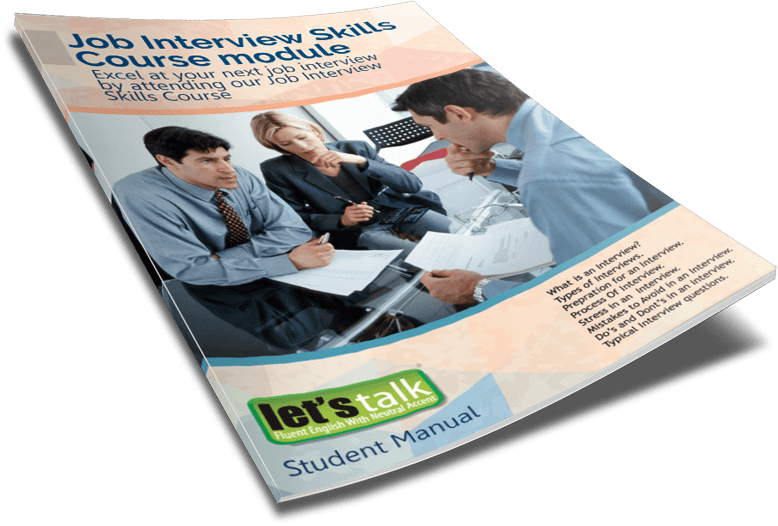 Job Interview skills training manual covers all the essential aspects of a job interview situation. Topics covered are – Job interview questions and suitable answers, dress code, resume formatting, cover letters, emailing etc. Become confident and convincing by developing a personalised strategy with your trainer for talking about your strengths and weaknesses and how you can be an asset for the job in particular. Get personalised answers to the most common, most difficult interview questions, the ones that throw most applicants off their game and put the interview into a tailspin. Get candid, expert feedback on your answers and what you need to do to improve your interview style and personal branding. Practice answering questions without sounding scripted. Rehearsing your answers before your interview is an absolute MUST, but come off sounding scripted, and you will blow your chances of getting the job! Learn the difference between behavioural and situational questions, and how to answer both types. These two types of questions are completely different. If you don’t understand the purpose of each type and know exactly how you should answer each one, your chances of getting the job will plummet! Our training program is ideal if you are likely to have an important job interview sometime soon. There is a maximum of 10 attendees in our training program, so you’ll receive plenty of personal coaching from your trainer. By attending this course you’ll ensure that you have the best chance possible of getting the best job that you are technically qualified to perform.